Networking is about developing professional contacts to tap for informational interviews and job leads. Career Services sponsors networking with professionals for all majors. We currently collaborate with college councils, student clubs and organizations, faculty, employers and SDSU Alumni to provide a variety of networking opportunities for students throughout the year. 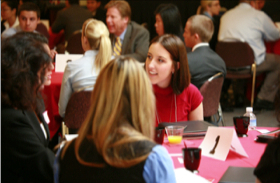 Speed Networking - Since 2009, Career Services has sponsored a “Speed Networking Series” for each of the colleges. The networking program allows juniors and seniors to develop their networking skills by meeting with professionals in a rotational format during a variety of formats. Find tips on business cards, email signatures, datebook, wardrobe, work samples, and more.